Thousands of different chemicals are used in large quantities in various industrial processes, and new chemicals are introduced every year. At numerous workplaces worldwide worker exposure to chemicals represents a serious health hazard. The type and extent of adverse health effects related to occupational exposure to chemicals depends on the intrinsic toxicity of the chemical, as well as whether the chemical is inhaled, deposited on the skin or ingested. It also depends on the intensity and duration of the exposure. The extent of exposure varies widely according to the industry, activity and country. Some chemicals cause adverse health effects in small quantities at low exposure levels while other agents in the work environment pose a low health risk even at relatively high concentrations. The basis for evaluating the instrisic toxicity of chemicals is in most cases animal studies. In a typical dose-response graph, the dose is plotted against the number or proportion of animals exhibiting a particular response. 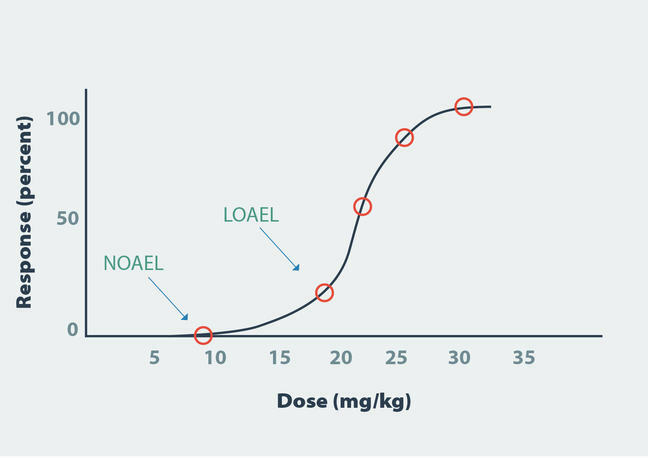 When used to characterize chronic toxicity for chemicals that do not cause cancer, the dose-effect relationship is examined to determine the highest dose at which no observable adverse effect is seen (NOAEL - No Observable Adverse Effect Level) or the lowest dose at which an adverse effect is observed (LOAEL - Lowest Observed Adverse Effect Level). The value on the curve is then extrapolated to humans to estimate the maximum exposures that are likely to be without adverse effect. Thus, even a chemical which is labelled as toxic will not cause toxic effects when the exposure level is below its NOAEL. Although several of the health risks related to chemicals are well recognized, adequate control measures to reduce exposure to acceptable levels have not been established in a huge number of workplaces, particularly in developing countries. The consequences of chemical intoxication also lead to great economic burdens on individuals, families and on society. The US National Library of Medicine runs the TOXNET web-site which is a comprehensive resource when searching for information on toxicology, hazardous chemicals, environmental health, and toxic releases. The European Chemicals Agency (ECHA) is also an extensive source of information on the chemicals manufactured and imported in Europe. It covers their hazardous properties, classification and labelling, as well as information on how to use them safely. It focuses on safe use of chemicals and has information on how to replace hazardous chemicals with safer alternatives. Chemical exposure occurs in virtually all industrial processes, and is particularly prevalent when processing chemicals and metals. For instance, risk of chemical exposures is often high in processes where volatile chemicals are used and during processes taking place at high temperatures, such as welding. Metals and metallic compounds can themselves be very hazardous, and can cause allergies or cancer. 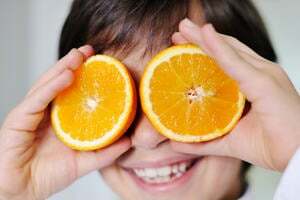 Gases and vapours can, depending on their chemical composition, cause mucosal membrane irritation, allergy, dermatoses, cancers and reproductive disorders. Exposure to vapours occur when using organic solvents, for instance turpentine/white spirits, toluene and alcohols in processes and industries. Examples include welding, painting, in laboratory work, as well as work in shoe factories, in the petroleum industry and in other chemical industries. Welding is a complex process involving high temperatures and/or pressures as well as chemicals to fuse pieces of metal together. The base metal is melted and a filler material is often added to form a pool of molten material that cools to form a joint that can be as strong as the base material. As a result of the high temperatures, a range of hazardous components can be released from the base metal, the filler and from any surface coating/paint left on the metal piece. When not adequately protected, not only the welder, but also workers in the surrounding area will inhale these components in the welding fumes. Inhalation of particles, gases and vapour from the welding process can lead to airway irritations. Over time, chronic lung diseases such as asthma, bronchitis and emphysema may result from this type of work. Particular care should be taken when welding on stainless steel where the welding fumes contain the carcinogens nickel and hexavalent chromium. Welding on pre-coated metals also causes serious concerns when the paints involved contain hazardous agents such as lead pigments or isocyanates. It is of great importance to know which chemical compounds are being emitted during welding in order to take the correct precautions for avoiding or minimizing any adverse health effects. There are a number of different welding methods in use, including Metal inert gas (MIG), active gas (MAG), Manual metal arc (MMA) (stick) and Tungsten inert gas (TIG) welding. The relative importance of emissions and exposure to hazardous compounds varies with the method used as well as with many other factors, including the base metal, the filler material and the coating on the metal surface. The table below gives an overview of some chemical hazards released during welding and the acute and chronic health effects related to such exposure. Epoxy; Welding and grinding surfaces coated with epoxy Airway allergy and allergic dermatitis. Welding on epoxy can produce toxic decomposition products. Phosgene; Welding on material cleaned by chlorinated organic solvents, e.g. trichloroethene Acute toxic and corrosive. Causes irritation at low levels (ca. 5 – 10 ppm). High concentrations (> ca. 90ppm) is corrosive on lung tissue and are ultimately fatal due to suffocation. Iron/iron oxide; Welding and grinding iron and steel Connective tissue proliferation in lung tissue, siderosis (iron lung) with increased cough. 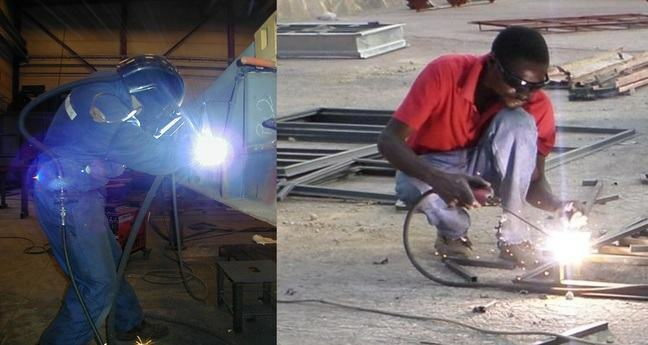 Manganese; Welding and grinding on most types of steel Symptoms of Parkinsons disease (tremor).